Have purchased approx 3,000 of these and have shot about a 1000 through a Romanian AK. Cannot recall even one misfire. Even though it is Hollow Point, I've never had a Failure to Feed or Fire and I use it on new NDS AKs, Norinco, Bulgarians, Hungarian AMD-65, Maadi, and VZ-58s, VZ2008s and no problems. I figure if it feeds Hollow Point when new it will feed anything and just get better. I like it better than Chinese ammunition. Cheap, excellent quality, no feeds or misfires from my Draco Pistol. Q: Are these copper jackets or bimetal? looking to use at a range that does not allow steel in the jacket. 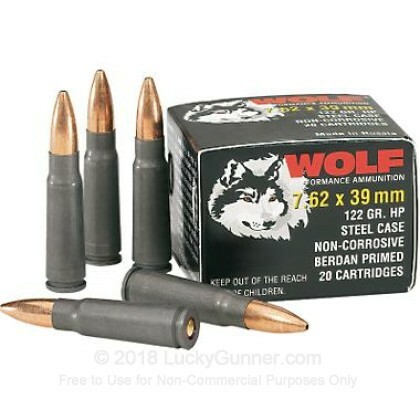 A: This Wolf WPA ammo is loaded with bullets that have steel in the jacket. Some of the S&B or Winchester 7.62x39 might be a better choice for your range.